UPDATE: I found that HP Pavilion dv6 have DIFFERENT body styles depending on the series. 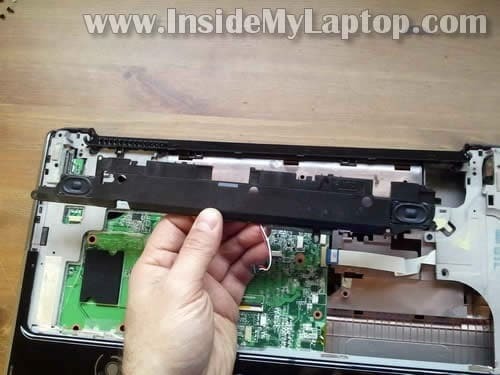 The disassembly guide on this page should fit HP Pavilion dv6-1000 and dv6-2000 models . 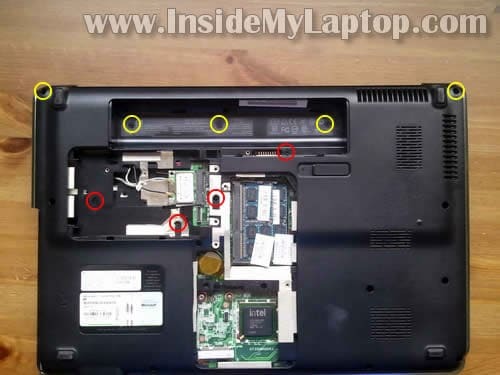 In my second take-apart guide I explain how to disassemble HP Pavilion dv6-6000 models. 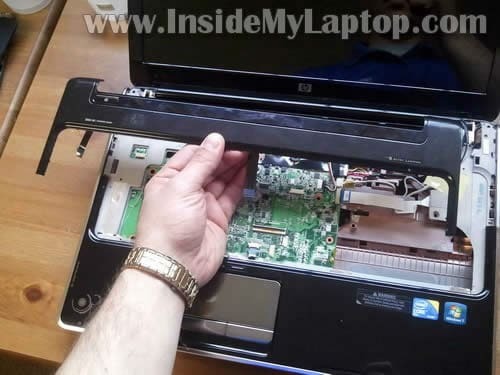 In my third guide I explain how to disassemble HP Pavilion dv6-3000 and dv6-4000 models. Loosen six screws securing the hard drive and memory covers. One screw (green) also securing the DVD drive. Remove both covers and pull the DVD drive out. Lift up the hard drive assembly and disconnect hard drive cable from the motherboard. Both memory module are located on the bottom. You can remove both memory modules. I’ll leave them connected to the motherboard. The CMOS battery located under the memory cover and can be easily removed/replaced without taking the whole thing apart. Remove five screws (yellow) securing the switch cover. Remove four screws (red) securing the keyboard. Lift up one side of the switch cover and continue removing it with your fingers. Be careful, the switch cover has two cables connected to the motherboard. You can see these cables on the next photo. Move the switch cover towards the LCD so you can access three screws securing the keyboard. Lift up the top side of the keyboard as it shown on the following photo. Move the keyboard towards the LCD screen so you can access the cable connector underneath. Before you remove the keyboard, you’ll have to unlock the connector and release the cable. 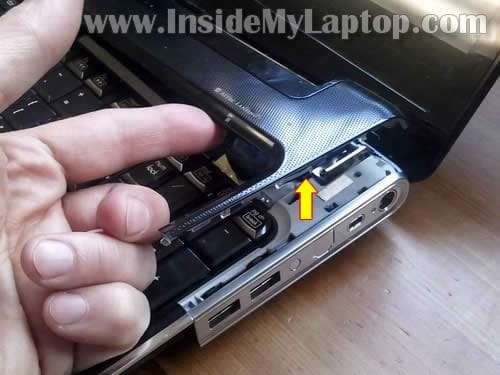 In order to unlock the keyboard connector, flip up the brown tab with your fingernail so it opens up at a 90 degree angle. On the following photo the keyboard connector shown in the unlocked position. Disconnect two switch cover cables (I mentioned them in step 6) from the motherboard. These connectors do not have locks. Simply pull each cable from the connector. If you plan to remove the display panel, you’ll have to disconnect both antenna cables from the wireless card. 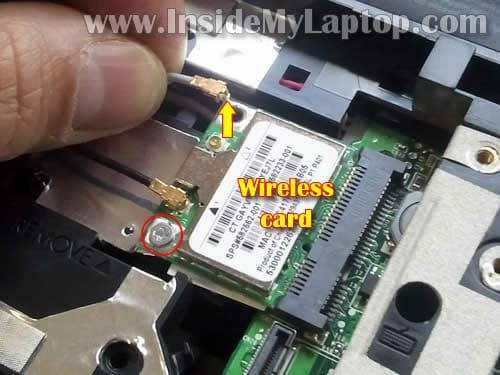 Remove one screw securing the wireless card and remove the card. Disconnect two cables (one of them is video cable) from the motherboard. Pull wireless card antenna cables though the opening in the bottom cover. In order to disconnect the video cable simply pull it up by the black tab. Lift up and remove the display assembly. In the next guide I’ll explain how to remove the LCD screen. One of the screws (green) located in the DVD drive bay. Remove four screws securing the speaker assembly. Disconnect touchpad cable from the motherboard. 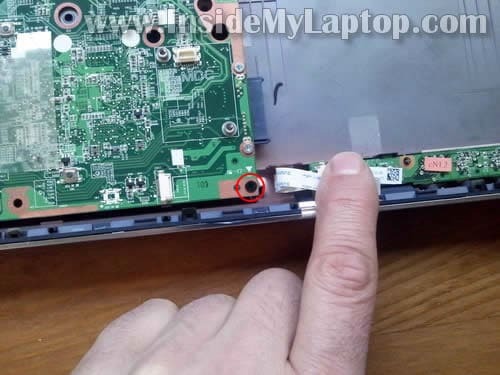 In HP Pavilion dv6 models the DC jack is not soldered to the motherboard. The DC jack attached to a harness and can be easily replaced without soldering. Remove one screw securing the motherboard. This screw located in the lower right corner of the motherboard. Remove motherboard from the base assembly. You’ll find the cooling fan assembly mounted on the other side of the motherboard. Now you can clean the heat sink and fan. Also you can replace the cooling fan assembly if it failed. I have question of my computer shutdown and charge prolem so my computer do’nt open so how. I open my computor? Please let me know. I have question of my computer shutdown and charge prolem so my computer do’nt open so how. I open my computor? Sorry, I cannot understand your question. Hello thanks for the great tutorials!! My laptop occasionally shuts down. The temperature is around 60-70c. Do you think it has something to do with the cooling system? Before i disassemble is there something else i can do to fix it? Most likely yes. Probably it happens because the heat sink is full of dust and CPU overheats. Sure. Try cleaning the cooling module with compressed air. 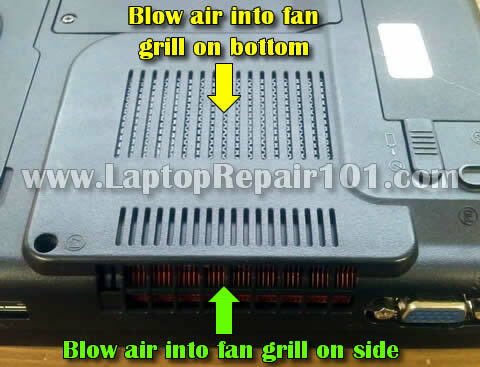 Buy a can of compressed air and blow into the fan grill on the bottom of the laptop. After that blow air into the fan grill on the side of the laptop. Do it until it’s clean. I think this will fix your problem. i have been having power issues, battery wont charge, and no light on dc jack when plugged in nor do i get power, power block from wall is fine, just replaced new dc jack and still not getting power. is there anything i will visibly be able to see to let me know what exactly is wrong? i dont see where the stby light is on the motherboard either. thanks! i have been having power issues, battery wont charge, and no light on dc jack when plugged in nor do i get power, power block from wall is fine, just replaced new dc jack and still not getting power. is there anything i will visibly be able to see to let me know what exactly is wrong? i dont see where the stby light is on the motherboard either. First of all make sure the AC adapter is working properly. Test voltage with a voltmeter. If your adapter is fine and replacing DC jack didn’t fix it, most likely this is motherboard failure. My daughter (away at school) is telling me that the metal plate by the power connector has fallen off of her DV6. I don’t see where this is available as a separate item. Is it likely that something has broken on the plastic case that has allowed it to fall off? Thanks. 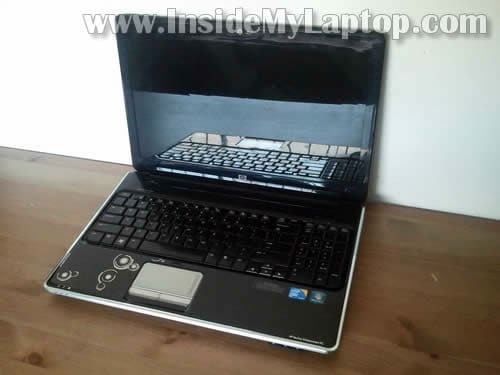 my dv6-1280el, became really noisy due to a fan placed close to the touchpad. The weird thing is that fan in the most of cases doesn’t work. Sometimes it starts to be really noisy, I suspend the laptop, after a couple of minutes I reactivate it, and the fan stops to make noisy. Which fan could it be? In that part the laptop is quite cold, is it the cpu fan? Hi, I’ve just striped the whole thing down and cleaned a whole lot of dust out of the fan. Just put it back together and now the screen doens’t work!!! Aside from the video cabe being incorrectly plugged in, what else could have caused this sudden loss of function i.e. Memory not being correctly inserted, HDD not connected? The caps lock and Num lock flash while the laptop is switched on. ok i did all of that and pc wont turn on took it to a shop and there telling me the power connector to motherboard is bad and im missing parts? what should i do? I’ve just striped the whole thing down and cleaned a whole lot of dust out of the fan. Just put it back together and now the screen doens’t work!!! Aside from the video cabe being incorrectly plugged in, what else could have caused this sudden loss of function i.e. Memory not being correctly inserted, HDD not connected? The first thing to check would be memory. 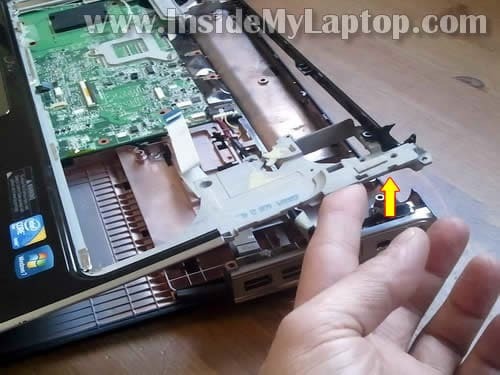 If it’s seated correctly but the laptop still doesn’t work, you can try taking it apart again and check for all internal connections. Probably something is not plugged correctly. Also, did you remove the heatsink for cleaning? Did you separate it from the CPU? If you did, make sure the CPU is seated correctly and the socket is locked. Hey it’s very important for my to know wich wire are on wich place of the dc jack. thx a lot..
I’m having a lot of trouble removing the switch cover. I removed all the screws but the cover is really stuck. How did you do it? Did you jam something in there or was it really easy for you? 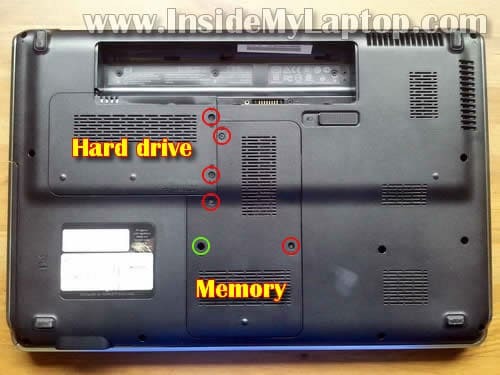 Hey man, just curious for re-pasting this model laptop with some artic 5 thermal grease, do I have to fully take out the mobo or can I just take off the back cover and get to it after taking out hd / dvd drive / etc. Thanks. 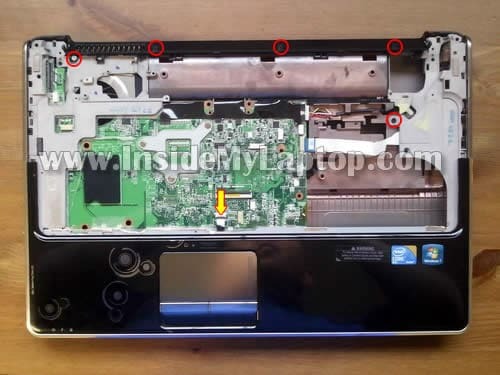 I am new for laptop service,but i open a dell latitude 505 laptop and its problem is to no power nothing happens its seems to me the problem is on motherboard and i found a IC L250 is seriously over heat . What can i do now ? 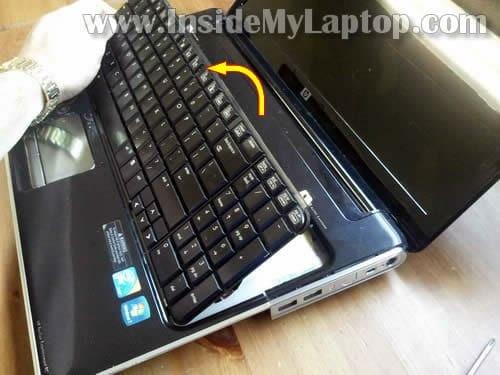 give any tips and sir I need a good laptop repairing books which is add with motherboard repairing give any suggestion . I have DV6T-1200 HP P laptop. As explained here I followed and replaced DC Jack and connect back the laptop. Now seems like it resolves the Jack issue, i can see the power. But suddenly nothing appearing on LCD. Did I missed any thing. I have cross checked the connection that goes to LCD on both sides (Video cables and wireless cables). Any clue would help to resolve the issue. I appreciate you r help. Fantastic instructions. I have a hp pavilion dv6z-1100 CTO, the right hinge broke. I bought a pair of hinges from hp for a decent price thinking I would install them myself. 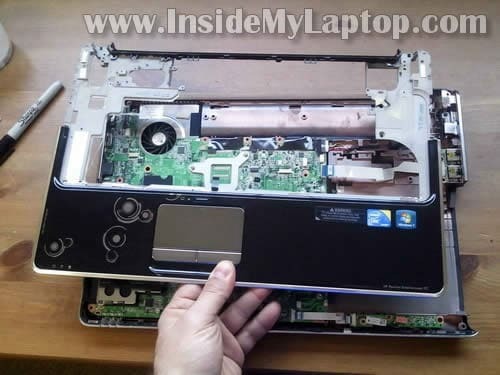 This is the first time I repaired a laptop, I have done some minor repairs nothing this intricate. I searched “Google” to check to make sure I had all of the tools I needed and thought I had an idea of what I was getting myself into. I read two or three repair articles that seemed to be skipping some important steps. 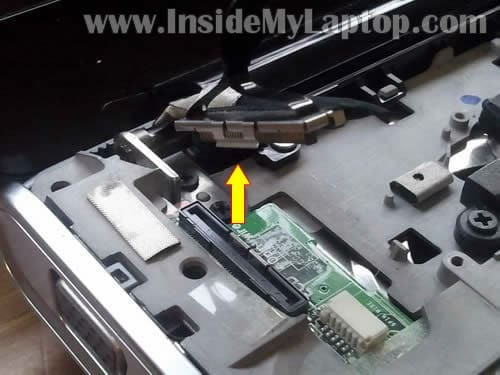 I was ready to put the laptop back together and take it to the local pc repair shop when I found “InsideMyLaptop.com”. This guy was dead on with his instruction and still pictures (I don’t like video-too hard to play and pause while trying to keep up with the instructions). Great site you really helped me out. I will bookmark and donate I plan to check here first from now on. I will recommend you to all my family and friends. Oh yeah, after I replaced both hinges and put back together my computer is up and running with no problems-a testament to knowledgeable help. Hi Tech. I need your help to find system board for HP DV6 2150er system board part number 574902-001. My problem is that when i power on the PC it show error 701. WLAN is not configured or is not intalled. The hole where the WLAN module goes was damaged i fix it with glue but it does not work and says above error. I need your help to find system board for HP DV6 2150er system board part number 574902-001. They supply parts directly from HP but it could be expensive. We buy lots of stuff from them and it’s a good seller. Thank you for your answer Tech. People like me from different countries of the world need tech.s like you when we need spare parts but don’t know where to get it as cheap as it is possible and in a short time. I went to that page but did not find the HP dv6 2150er model… Plz could you find the price for the system board that i need. And if you can plz tell me how much it will cost to ship it to Baku/ Azerbaijan Republic ( Caucasus) . Plz could you find the price for the system board that i need. And if you can plz tell me how much it will cost to ship it to Baku/ Azerbaijan Republic ( Caucasus) . You can research the price if you google the motherboard part number. How much would it cost to ship to Baku? I have no idea. I don’t even know if people will ship there from US. 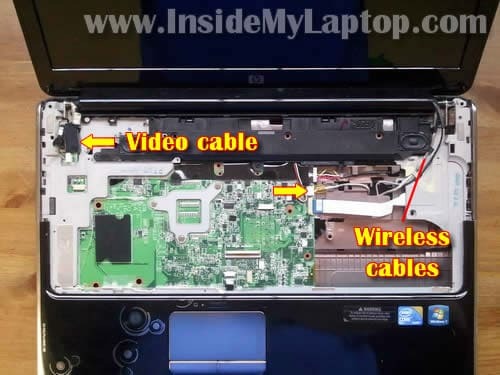 Hi, i’d like to know which wire is for my internal mic/webcam. I’m thinking it’s the unlabeled wire in step 16 but i cannot be sure. Anyways, i took my machine apart and put it back together and now it doesn’t work. then i took it apart again and reassembled it, and it still doesn’t work. Any ideas? hi. Can you tell me where is the Lid Close switch?? Is it in the Hinges somewhere?? Can you tell me where is the Lid Close switch?? Is it in the Hinges somewhere?? I don’t remember off the top of my head, but most likely this laptop has a magnetic switch – a small magnet (located under screen bezel) activates the switch (located inside laptop). It’s not in the hinge. I could not find HP DV7 but I guess DV6 will be much similar too. Num Lock, wireless and few other touch LEDs are not working. Where can I find them online so I can replace them. Also all other LEDs for volume control and next track etc do not work either. Will replacing them be enough to make them work? Here’s HP Pavilion dv7 disassembly guide. Are you talking about LEDs located above the keyboard? I believe they all located on one button board. You can remove the keyboard cover as it shown in the step 8 and try replacing the button board. So my question is, can this Centrino 6300 card be put into the HP dv6-2066dx, and if so, could you please explain to me how you go about putting a 2nd and 3rd wire antenna onto this Centrino card and where do you stretch out those wires so that they are effective? It will fit physically and most likely will be recognized correctly after you install the correct driver but I’m not sure about the third wire. I don’t know if you can fit it into the laptop. Normally antenna cables running inside the display panel, under the LCD screen. Thanks for that answer. I suppose I might be able to manipulate a wire through the display. One more quesiton? Are those type of antenna wires with the plugs that fit onto the wireless card (universal plugs?) available easily enough to buy? Are those type of antenna wires with the plugs that fit onto the wireless card (universal plugs?) available easily enough to buy? Laptop antenna cables can be found on eBay. I have a DV6 1030 and the power LED on the left front side does not lite nor does it power on, i thought this was the MB so i replaced it but the same, how can I check the DC jack and cable to ensure this is the cause of my problems, i do have the LED lite next to the DC jack. I have ordered a new DC jack, but just in-case this is not the issue what do you think it could be? Is it possible to test the MB without having to re-assemble? Mine is DV6 1001-x; followed your disassemble steps to clean the fan using the air duster – as the laptop was making noise and getting hot quickly. Followed up to Step 14 and then removed the speaker @ step 21, enough to show the fan half-way to bust it with air duster. I have assembled it back and the problem seems to have gone. But got a new issue. The display panel, on the front top has everything working (power, volume control). But the volume touch button (on/ off) ; wireless touch button (on/ off) is not visible/ functional at all. Only these touch buttons are not available but the wireless is working and both can be software controlled within the windows. Its probably something to do with Step 13 switch cover cables. I have slotted in correctly though. Anything suggestion where to look for? I think you are correct. Your description sounds like connection related problem. Make sure the cable shown in the step 13 is seated correctly. Also, check connection on the bottom side of the switch cover. Maybe you accidentally pulled cable from the connector while removing the cover. Step 24, small screw-like pin holding the grey to the copper color? How do I remove it? I don’t see it mentioned in your tutorial. 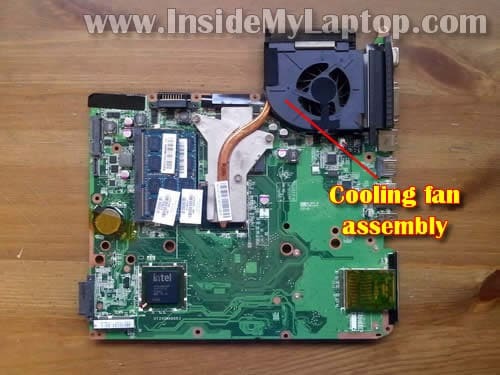 The fan has failed on my wife’s laptop the HP listed above, but do I have to do the complete disassemble to replace the fan? Thanks. 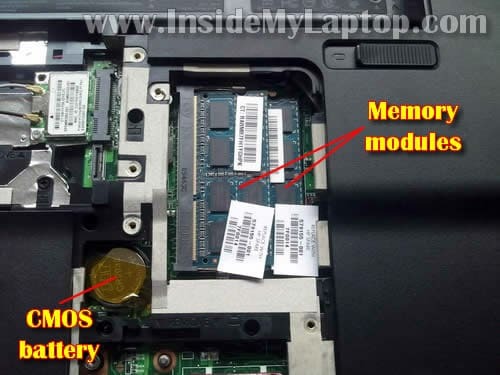 in photo of STEP19, what is that black square module with the “intel” brand below the RAM modules? I opened my Pavilion dv6 today and found out it is missing… Maybe the guy who checked my laptop out before might have taken it away..
First of all, make sure the cooling fan spins when the laptop is getting hot. If not, probably the fan failed and has to be replaced. If the fan spins, most likely the heatsink is clogged with dust and the laptop overheats because of that. Blow off fan with compressed air. Make sure there is no dust in it. Test the laptop again. First of all, thank you for this guide, it was by far the best resource I found online for this operation. Having followed the instructions so that I could clean the fan I found upon reassembly that my laptop (dv6 2115sa) takes a long time to boot-up, the now immaculate fan whirring quite noisily in the meantime. In addition, once it has booted-up and I have logged-in – or sometimes during the boot-up itself – the laptop switches off without prior warning and for no discernible reason. The standard error message “windows was not turned off correctly” appears when I switch it on again. I have no idea what is causing this, so any advice would be most appreciated. Having followed the instructions so that I could clean the fan I found upon reassembly that my laptop (dv6 2115sa) takes a long time to boot-up, the now immaculate fan whirring quite noisily in the meantime. In addition, once it has booted-up and I have logged-in – or sometimes during the boot-up itself – the laptop switches off without prior warning and for no discernible reason. 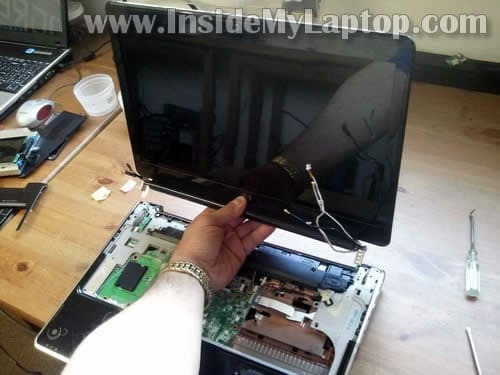 Most likely it happens because the laptop wasn’t reassembled correctly. I would check all internal cable connections and make sure all screws are installed correctly. Sorry, I cannot tell what is wrong without looking at the laptop. I have a Hp pavillion dv6 2015ea entertainment pc laptop.It got stuck while I was working. I had to turn it off by the power button. Now it isn’t turning on. CAPS LOCK and NUM LOCK LEDs are continuously blinking. Hard drive indicator turns red and I can’t feel the hard drive running. But the hard disk works with my other laptop. any idea about this problem???? tnx. I have a HP PAVILLION NOTEBOOK DV6-2010SA laptop does not turn on. When you plug the laptop charger in to the laptop the white light comes on to indicate power. However when you press the on button there is no noise or lights (only the charger light one). I guess it’s a faulty mothterboard? Can anyone advise how to fix it? Great info! Just one comment, on step 15, you state “if you plan to remove display panel…” this is REQUIRED if you need to get at the cooling fan assembly. No problem since you gave all the steps needed to accomplish that. Wife’s laptop, cleaned, but still a little noisy. I imagine the fan is due to fail soon. Once again, great info, and thanks. Thank you so much for publishing this!!!! Hi, great write up and I think it will help my problem. Can I replace just the fan, or is it one complete assembly with the heat sink? When I click on the eBay link, I get both options. Hope I replace just the fan, the whole heat sink assembly is more costly. J’ai un ordinateur portable HP PAVILLON DV6-1417sf ;Il ne s’allume plus. Lorsque vous branchez le chargeur de portable pour l’ordinateur portable de la lumière blanche s’allume pour indiquer la puissance. Toutefois, lorsque vous appuyez sur le bouton il n’y a pas de bruit ou la lumière (seule la lumière du chargeur). Je suppose que c’est un mothterboard défectueux? Quelqu’un peut-il conseiller sur la façon de résoudre ce problème?Es ce la carte bouton? et quelqu’un connait il la reference du SOT23 marqué ” 5Ef ” sur le boitier repere HE 1? I had my DV6 motherboard replaced and now my DAW won’t load because there is no serial number. Can I put a serial number in the bios? I could be wrong but I believe you need a special HP boot disk (available only to HP certified technicians) to write the serial number. I would ask the motherboard seller if they can provide the disk. I desperately need help. When I switch on my laptop theaudio runs, but nothing happens on the screen. I have no money so hoped and prayed if I followed your steps to disassemble, clean out thecdust and reassemble might help. Now when I switch it on absolutely NOTHING happens when i switch it on except for the fan thats running. Please help. I need my computer for all my work and I need my work to merely just survive. Please please please help. I dont know the name of the touch button in the center ( up ) for the voice control. I am loking for drivers. Can anyone tell me were can I get a new motherboard, for my laptop hp pavilion dv6 1235es? After disassembling my hp dv6 1234nr I discovered that the flat cable that attaches the power button to the mother board is damaged. Having trouble locating a 6 pin cable. Do you know a web site or company name that sells cables for the HP Pavillion DV6 1234nr? HP has a cable kit but the $57 price is way too much. 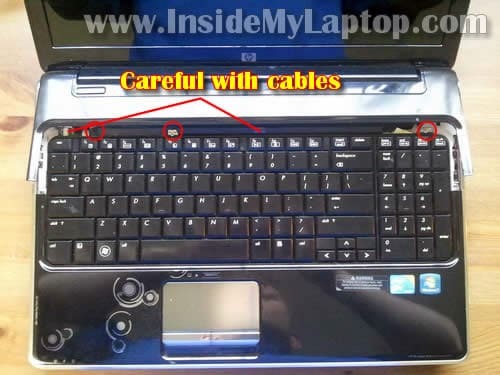 Check out power button cables for HP Pavilion dv6 notebooks available on eBay and find the correct one. Thanks for sharing this great article. I have disassembled and reassembled my HP DV9000 using this tutorial. God bless you! Tech question, great info, btw. we have a dv6 error message read replace internal battery, I replaced the CMOS battery. It now will not start up and displays a blue screen with light emitting at the to , is if you we’re surfacing underwater. Any suggestions? Thank you for this tutorial..This is invaluable. Excellent information and clear pictures. Thanks. hey I have a hp pavilion dv6 laptop and scared to open it! lol its 3 years old and it over heats a lot need to clean the airvents, fan and change thermal paste. if I open it will it get broken? Thanks to your tutorial I have cleaned today my DV6-2080es for MY first time (two years ago I carried the laptop to a local seller and I had to pay 35 euros for this cleaning). I specially recommend this step by step video tutorial too. I had never totally disassemblied a laptop before (I had only removed some fans on Toshiba laptops using the back lid specific for this purpose). Now the laptop works much more cool and fast. The process is easy but you must be specially careful in general (and mainly with the cables and connectors). 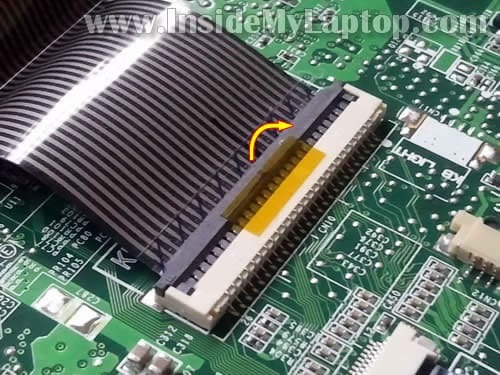 The heat sink can be dissasemblied into two pieces because there are three tiny srews that, if removed, let you separate the plastic fan from the “copper piece and ventillation grids”. I comment it because it´s much more easy to clean the fan if you remove those tiny screws. This doesn´t appear in the last picture or in the final text of this post. We could say there is an aditional step missing and maybe some people don´t realise about this possibility if you don´t mention it. It would be interesting that you indicate it. Can you also post on “How to disassemble the internal Fan” as well? Many many thanks for hours long process that you made available for the world..! 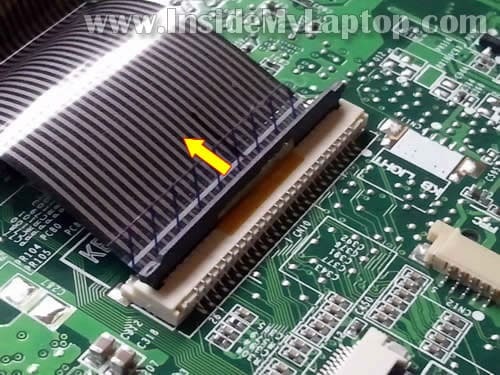 There shouldn’t be a problem separating the fan from the heatsink once it’s removed from the laptop. Probably there are just a few screws holding it together. I checked eBay listings and they are selling just fans. It means the fan can be separated from the heatsink. Thanks for clear info. Could you possibly add the screw sizes to the text / pictures? That would ease the assembly job greatly. The sizes can be seen from the maintenance and repair manual but it is not as good for quick reference. So, in order to replace simply the cooling fan, you have to remove ~everything? Yep. The cooling fan mounted on the bottom side of the motherboard and there is no easy access to the fan. You’ll have to go though all disassembly steps and remove the motherboard. Where to order front panel where power button is inside? Can find all parts but not that one that sits on the speakers. I had to take mine apart to replace the bottom case, keyboard, switch cover, and top cover assembly. It went well, but now I have no bluetooth. My computer does not seem to think I have any. I want to fix my laptop’s key. They are in the bad state. 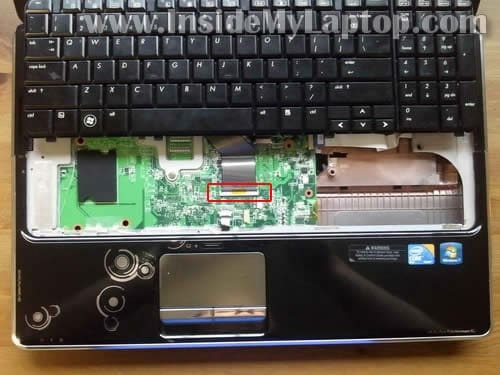 Can you suggest where i can buy internal keyboard for dv6 pavilion 2359tx entertainment notebook. Please suggest online medium to buy. The computer featured here doesn’t seem to have bluetooth but I think most of these do, mine certainly does. 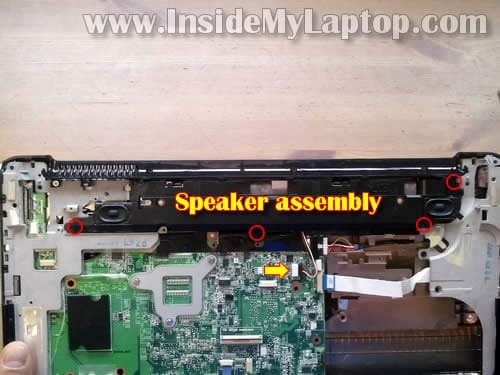 It’s a small component that would be visible in the picture of step 20, to the left of the speaker assembly and slightly overlapping it. Also, it’s connected to the motherboard via a short wire that has to be disconnected during disassembly. Perhaps you forgot to reconnect it because that step is missing from these instructions? I hope that’s helpful and that I’m not mistaken in anything as I’m really no expert. Ps. Thank you for this exellent piece! I wouldn’t have gotten anywhere in trying to fix my noisy fan (two loose screws holding the cooler down) without this. what are the two switch cover cables connected to the motherboard for? i accidentally broke the one kind of under the ‘l’ and ‘;’ buttons wen i was trying to remove it from the latch. I thought it would be broken but my laptop is still working. However, i want to make sure everything is still working well. Is that cable important? I just want to say, I am grateful. I got stuck at step 8. I can lift up the two top corners of the keyboard but the middle seems to be stuck. I got all the screws out as far as I can tell. I already broke off two keys trying to pry it up! Help! 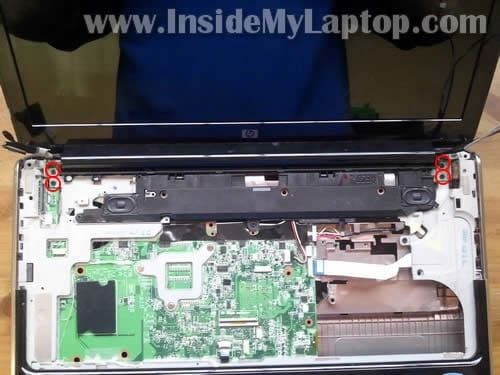 I have hp pavilion dv6-2150us and I replaced its motherboard with the model for hp pavilion dv6-2143sf….since then it starts shortly for not more than 5 minutes what can I do? Hi, this is a great tutorial and I’m at the stage after removing the keyboard. My model DV6 uses this case design and is a win7 model, I’m not sure of the processor type as I got it from a thrift store for cheap but the entire unit is in out of the box new condition with no scratches or missing parts ( I know right!! ). The reason I’m taking it apart is because it will not boot, I put a fresh battery on it and plugged it into a charger as I have two other DV6 and what it does is show the three lights typical for a start up for a second then goes off so its a 1 second flash then nothing. There’s no evidence of water damage anywhere inside so far and not a single hair or bit of dust anywhere and no burnt smells either. The power jack lights up when plugged, the original battery is currently being used on another DV6 and works fine. I’m wondering what your thoughts are on where I should look for the culprit in the unit to replace it. Thank you SO much for this guide. I am so eternally grateful. 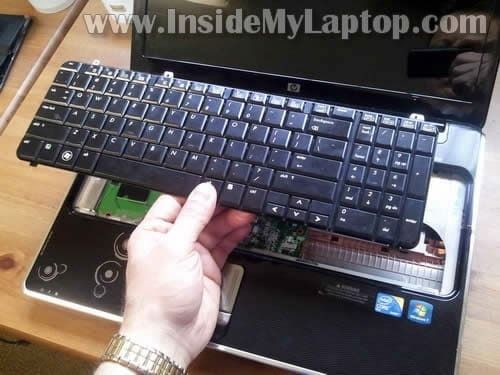 I type this on my laptop keyboard that I just replaced using this guide! 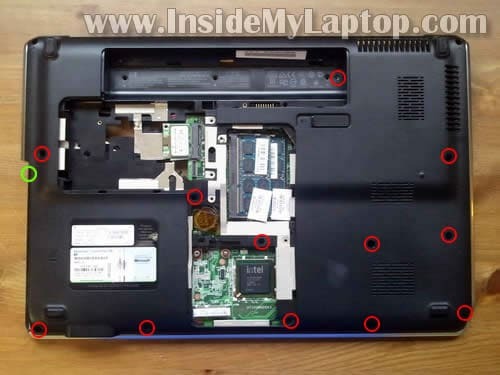 I have no prior experience replacing laptop parts, but this guide walked me through replacing the keyboard on my 2009 Hp Pavilion 1000 series laptop! I have this exact same laptop but im having trouble with all my usb ports none of them are working in device manager it says they are working properly but if I plug anything into any of them it does nothing at all as if I hadn’t plugged something in if you can please help me!!! I just want to get the top cover of the keypad area off so I can access the bottom controllers. The left one is not secure and wobbly. I follow you to stage 14. At that point I assume I can access the screws securing the lower part of the keyboard top cover? Can I access the screws earlier OR is stage 14 and then screw removal correct? Can you help me to obtain the proper hard drive carrier for HP dv 6 2115 SA?